The Emkay Group, owned and controlled by Tan Sri Mustapha Kamal Abu Bakar, is set to become one of the country's top "green" property developers with the launch of its first and very own green office building in Cyberjaya. To be opened in December, the Emkay Group through its associate company Joyful Gateway Sdn Bhd, will set another benchmark in the country and Cyberjaya's green building development. The RM150 million office tower, which will be occupied by a multinational oil giant for the next 10 years, is set to be accredited as the country's first LEED gold certified building by April next year. The LEED or Leadership in Energy and Environment Design rating and certification standard is a green rating given by the internationally recognised USA Green Building Council. LEED rating has four levels of certification, including platinum, gold and silver certification. They promote design and construction practises that increase profitability, reduce negative environmental impact of buildings and improve occupants' health and well being. The LEED rating system is based on six green design categories which are sustainable sites, water efficiency, energy and atmosphere, materials and resources, indoor environmental quality and design innovation. The office tower project was awarded to the Emkay group in October 2009 via an open tender and is expected to be launched by Prime Minister Datuk Seri Najib Razak. "The experience accumulated by the group over the years has enabled us to build this green building," said Balasundram. 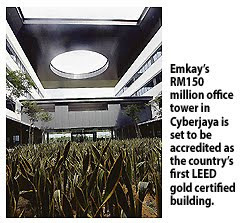 The green building is 100 per cent developed by Emkay group via Joyful Gateway and is the first building in Cyberjaya to be pre-certified with the prestigious internationally recognised LEED gold certification. The tower will house five levels of office space and three levels of sub-basement for car-parking. It is designed to conserve energy and natural resources and provide for a healthier and safer environment designed to improve the quality of human life and increase the productivity of operations. The form of the building capitalises on the natural terrain of the land, which slopes down towards the back. This allows for the sub-basement carpark levels to be naturally ventilated and minimise energy usage. Other green features include the use materials with higher recyclable content and energy-efficient equipment, the enforcement of water efficiency strategy, the control and management of the environment during construction and also the strive to improve the quality of the indoor environment. JOHOR BARU: Telekom Malaysia Bhd (TM) will next year sign service agreements with 19 property developers in Johor to provide high-speed broadband (HSBB UniFi) services in their projects. TM Johor general manager Mohd Roslan Mohd Rashidi said all 19 projects were located within Iskandar Malaysia in greenfield areas where it would be easier to lay the HSBB infrastructure instead of brownfield areas or places that were already developed. “Presently, 2,000 premises within Iskandar have access to HSBB UniFi and the figure is expected to increase to 120,000 by 2013,” he told a press conference after an agreement signing between TM and UMLand Bhd subsidiary Dynasty View Sdn Bhd for the provision of HSBB UniFi services in Taman Seri Austin. All 316 double-storey link houses in the gated and guarded precinct under phase three of the project will receive free HSBB UniFi services for up to two years. Taman Mount Austin is the second housing scheme in Iskandar to have HSBB UniFi connectivity. TM had in August signed a similar agreement with Mudra Tropika Sdn Bhd for its Nong Chik Heights project. Roslan said TM would also extend the HSBB service to Pasir Gudang and Seri Alam in a few months. Areas in Iskandar that currently enjoy the service are Nusajaya, Permas Jaya and Senai. “The Johor Baru city centre transformation plan also includes HSBB UniFi connectivity,” he said.